It was nearly time for the first Open 5 of the year and I had not done enough mountain biking! Swimrunning all year had left me out of practice, and a couple of planned rides did not happen. I had arranged to go for a long test ride with Elizabeth, after the ‘rope across bike path incident’. That went well enough and I only fell off once despite the snow patches … so maybe I was ready?! I had travelled light to the event and as we sat in the car in the early morning gloom I saw the dashboard thermometer read -3oC and by the time we got to the event start it said -6oC. Hmm. I might have chosen a different jersey if I had known that! However, the forecast was for sunshine and warming up so I stayed resolute. Well, I had no choice. On went the arm warmers, gilet and lobster gloves at least! Highlighter always to hand for me, hairbrush for Lucy! Looking at the maps at the start we knew we had to bike first. There was a big, obvious and committing loop winking at us. We wouldn’t want to run first and then find we had run out of time to do it. This was a slight shame as we’d have to ride before it warmed up! In fact just getting to the start was slightly traumatic, as Lucy’s fingers stopped working and we didn’t have the luxury of fully warming them up before we were hustled through the start. We had 3 minutes to spare though, no problem. Looking at the control values, we had a change of heart. We shouldn’t do the loop, but some funny zig zagging to get all the high value ones to the south. Off we went in the opposite direction to our original plan. One glitch when we paused. ‘Maybe the control is on that fingerpost?’ ‘Let’s carry on and check the next one’ ‘Oh, it was the first one’ – duh! A little time lost, but not a lot. Saw James so made sure I got back on and started riding! I was doing OK riding the uphills and wide tracks but was freaking out a bit at the icy patches, downhills and techy bits. Think this was a combination of lack of practice and additional fear about falling on my only partly mended shoulder. I was feeling a bit sick from the fear of it and struggling to keep up, so I just let Lucy lead the way. At the bottom of a long holey section I found her considering the map. ‘We’d be best going round!’ she said. I was more than happy to trust she had figured it out right, so on we went following our original plan, but in reverse! We were joined by a male pair who followed us through a village and another overshoot. We must have been chatting and not paying attention as this control was very obvious – we just didn’t have our eyes out for it! There followed a slightly uncomfortable busy road stretch with the low sun in our eyes, but before long we had one last mega climb to burn our lungs and legs. The descent was fun, I was pushing myself a bit more, spurred on by not wanting to get caught by any of the riders we’d seen tailing us into the previous out and back control. A spin down a road closed due to subsidence and now covered in leaves and free of traffic was a delight. 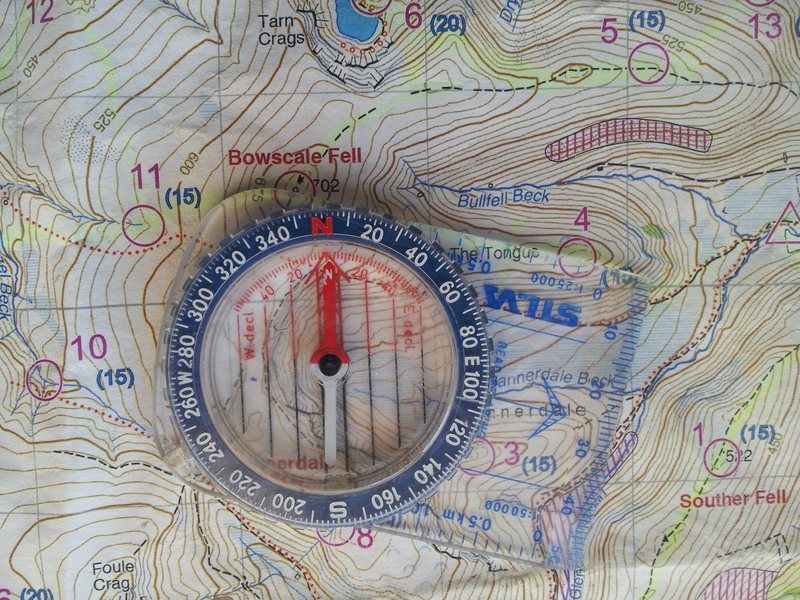 We nipped through the outskirts of Keswick taking care with the map. I was tempted to start smashing it, but was very conscious of the run ahead so kept it reigned in 🙂 We were soon rolling back into transition. We got a control here, I never even saw the stone circle! It was the right decision to bike first as we now only had 1.5h for our run. 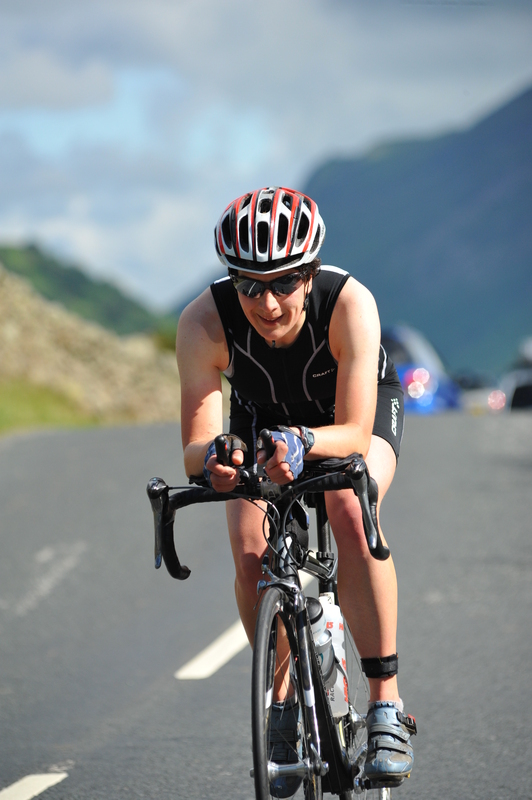 I’m not used to racing this way round and probably hadn’t eaten enough, so got some extra food down in transition. We hared off at high speed despite having ‘just-off-a-bike’ legs. I quickly shoved the map in my bag as there was no way I had time to look at it. In fact, I was working so hard at keeping up I never even noticed a fine stone circle in the same field as a control! Our pace was pretty high, even with rough ground and gates and stiles. I was feeling uncomfortable and my right leg was hurting in all sorts of places. I tried to relax and decided more food and drink was needed. I even resorted to a gel, which was like manna from heaven, so it must have been bad. We marched up a rather steep hill, walk, run, walk, run. When we could see the sun, it was blinding. When we couldn’t, the side of the hill was in shadow and was dark and cold, with the grass frozen hard. At the summit we struggled to find the control. ‘’Thread’ 7m east of summit’. Was the summit the top looking bit, or the cairn? What was a ‘ thread’? We were circling the top, taking paces, checking the compass. Lucy was about to get me to take photo proof, when we found it on a little outcrop, only visible from below. Right, decision time. We pondered a longer route getting an extra two controls, but decided to be conservative, taking a route that we should have ‘loads of time to do’. I slid on my bum coming down the steep bank, but then we were off again. Lucy put me on the tow (no debate) and I was getting pulled along, not being able to see for both the sun and Lucy’s legs two feet in front of me. It was quite funny, but she was relentless even on the rough downhilly bits! I was feeling better, the food must have finally got into my bloodstream. Finally, we rounded a corner and could see the finish up a hill in front of us. Other racers were returning to download along the road and shouted encouragement. Into the field and one last uphill slog, the tow now slack as we were both at our limits. Back to download before the cold sunk in and I even had time to wolf down a bowl of Nav4 veggie chilli. James T was very obliging in hurrying along the prize giving. I had a train to catch! We won our category and were 14th overall (same score as 12th and 13th but slightly later back). That top 10 still eludes us, but this was a great start to the season! Thanks to all involved in organising and to James Kirby for the photos. After exhausting myself in the trail race the day before, it was all I could do to eat, drag myself back to the campsite and collapse into my tent for the night. Luckily when morning came, the night time showers had passed and I had plenty of time to get ready. I made the trip back through the woods and over the hill to the festival village one last time, lugging all my gear with me. The swim was two laps out to and around Derwent Isle. The water was reportedly 11 degrees, and when I got in it was definitely warmer than my recent acclimatisation swims. There wasn’t much jostling for the start line so I thought perhaps it would be very civilised. No chance! When the hooter went, everyone pushed and shoved a bit until we got our order sorted out. Once we left the muddy shallow waters, it was beautifully clear. I could see random things on the bed of the lake, like an old umbrella and some railway track. Sighting as we went round the island was hardly necessary – keeping the bank a constant distance to my right was enough, plus staying in water just deep enough to avoid the occasional rock that loomed up. I had a slight panic wondering where we were supposed to head towards the shore before going back out for the second circumnavigation. I had images of going round and round the island indefinitely … but the mass of white tents of the festival village came into view, along with a buoy marking the ‘turn’ point. I was still feeling good and enjoying the cool water. I was also starting to close the gap on a group of swimmers in front, which is my usual style when swimming (I’m a slow burner!). As we rounded the top for the second time I felt good, and was swimming near another person. I caught a few glimpses and was fairly sure it was a girl. I kept trying to come past, but every time I drew level, she pulled away again. I was running out of juice! As we approached the shore, she and another swimmer took a different line. I hesitated but decided to be confident about what I was aiming for. Then I was near the finish pontoon and the other two swimmers suddenly appeared just in front of me! I had been keeping it in mind that the time didn’t stop until we crossed the timing mat; which was up the shore and onto the grass. I swam all the way in whilst a man stood up and walked in unsteadily on the uneven stones. I sort of launched out onto the plastic blocks like a creature on a David Attenborough show. I had been right – there was the guy I had just passed and the other person was a girl. Time to switch from amphibian to cheetah! I sprinted up the matting and had to make a split second decision to go onto the little stones in my bare feet to be able to overtake. I threw myself over the timing mat just in front. Paul, the race organiser, just shook his head laughing at me 😀 . 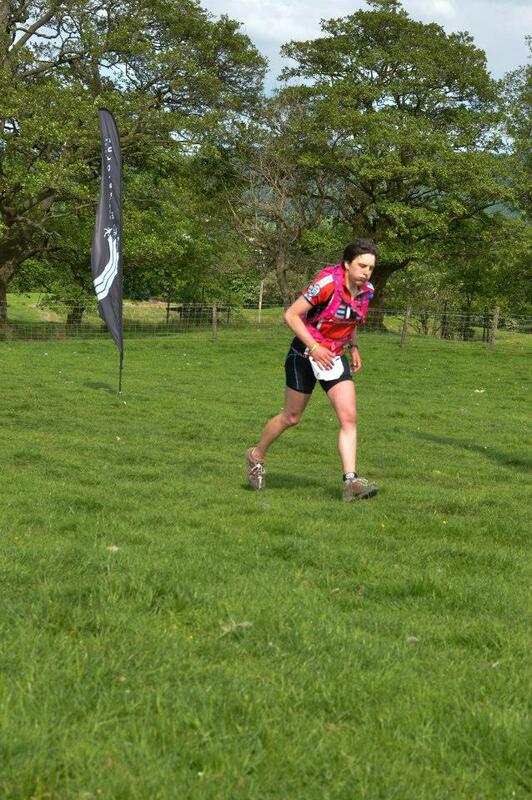 We were both given the same time, but I finished ahead, placing 3rd female / 11th overall. I felt a bit bad doing that, but sometimes racing does get tactical and I was pleased to get on the podium in both races at the weekend. Though I did have to wait until prize giving to find out! Next up I’ll be back to multisport at the Isles of Scilly swimrun. After the last Open 5, I was feeling a bit grumpy and demotivated with no races in the calendar until the Isles of Scilly swimrun. So as well as the mountain bike event last week (which was just for fun), I searched around and found the Keswick Mountain Festival (KMF) had a whole selection of races. It was also well placed in my race calendar. So I entered the 25km trail race on Saturday and the 3km swim on Sunday. Might as well make a weekend of it! I travelled by train and bus to be greeted by spits of rain. It was an uphill walk to the campsite as the rain got progressively heavier. It was a test of speed to get my tent up without the inside getting wet and before all my kit got completely soaked sitting on the grass next to it. I crawled inside and listened to the drumming on the walls whilst I put off getting all my waterproofs on to go for a final wee. All night the wind blew hard and the rain fell. But next morning it was drier and I walked to and from registration without getting wet! No such luck for the start of the race. At the last minute I decided to carry my waterproof after all, even though I was wearing a windproof because it was really chilly. I needn’t have done. Within half an hour of starting, the sun was out and I was stripping off on the move, stuffing my jacket into my bag. I knew the start was quite tight and there was a road crossing with a narrow gap in the wall. I got myself near the front to make sure I wasn’t held up. Past the campsite we went again and over undulating terrain, with a generally upwards trend! 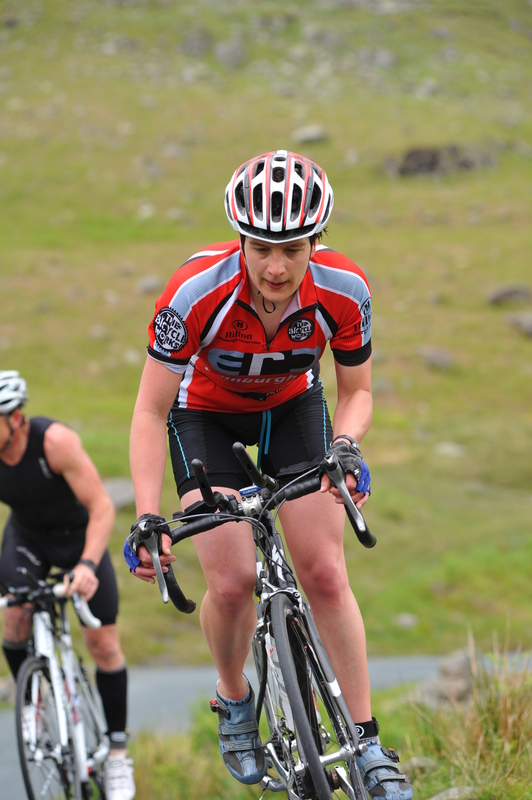 I was feeling good, powering over the tops of rises. But then the track got technical. There were roots and rocks and steps. I could hear people behind me and sensed the footsteps hot on my heels. This pushed me to run harder, to concentrate on keeping moving over the obstacles. Although one or two guys came past me, there weren’t many, which was pleasing. Unfortunately, this effort was also taking it out of me and I realised I was overcooking things a bit. I was feeling a bit woozy and tired and we had only done about 5km! I slowed a fraction and made sure I was drinking. Just after that a girl overtook me. I was pretty sure there were only two ahead of us, so that meant I had just moved from 3rd to 4th. At the feed station she stopped, whereas I ran straight through. Presently she caught and overtook me again. I kept her in sight and the gap wasn’t widening significantly, but I couldn’t close it. Up and over what I knew was the last big climb, and I had to work hard on the descent. Now people really were coming past! We finally got to the road and a spectator confirmed I was in 4th – ‘but 3rd is just in front’ he encouraged me. I was pretty sure this is how it would stay, especially when the gap remained after the next feed station. However, the track was now easier and flatter, so I got into a rhythm and my own pace and soon I realised I was catching back up. I was feeling good again and even managed a cheery joke with a marshal about stopping at the tearoom. When I made contact I fell into the speed of the little group and ate a gel. Some more technical bits followed. I managed to trip over my own foot (to be fair, I sometimes do this on a tarmac pavement too) but after a while I felt I was ready to move on. Looking bedraggled, rather hot and only 5km in! Nice little surprise in wait at this point as the route tipped upwards again. In my head this half of the race was more or less ‘flat’! I kept working, occasionally glancing back and seeing the gap was not much. 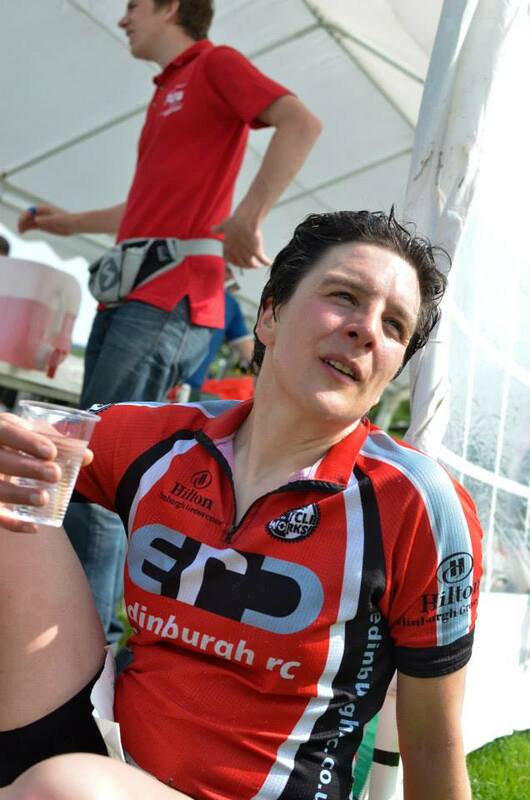 My water was running low, and at the final feed station I stopped for an electrolyte drink. I was feeling parched and it was much needed, despite my initial scorn at why a station was needed so close to the end! In Manesty Woods we all went the wrong way. I had peered at a junction, but with no arrow or flag in sight, carried on the main track. I was starting to worry about the lack of flags, but 400m later, the route popped out again on our left. It turns out we went the ‘long way’ round anyway. Looking at Strava flybys later, we clearly weren’t the only ones! This was the only route mistake though, as it was well signed with little red flags dancing in front of us the whole way. ‘Just’ a few km to go, but the vigour of an hour ago had left me and now it was beginning to hurt. All I could muster for the marshals was a grunt and half a wave. I promised myself the last remaining gulp of water I had left after the next km. I kept thinking, ‘less than a parkrun to go’. In some trees we turned off the main track and uphill again. The scent of flowers was heady in the air. We were twisting and turning a bit now, which was to my advantage as I would be hidden round the corners. Now when I glanced back, I could not see my rival. I dare not let up though, even though I could feel my body was flagging. Please, can I stop running yet? We got to some streets and had to be close to the end of the lake. Round we went, almost there. My watched beeped 24km. I had plotted the route on a map beforehand and suspected it measured long, but I kept hoping I was wrong. This was hurting so much! We seemed to wiggle and turn, avoiding every direct route back to the finish. Finally I could see some flags, but even then there was a zigzag to get to the finish arch! I was grimacing and collapsed on the floor. My watch read 26km. After a bit of recovery (=lying on the floor groaning) I couldn’t quite believe it. This was a big race with over 200 women entered, and about 170 finishers. I had aimed for top 20, would have been more than happy with top 10, had believed at one point I’d finish 4th, and then had made it to 3rd. In fact, it turned out that another girl had been closing the gap and slipped in between myself and the person I had been racing. I had needed to keep pushing! I was 45th overall out of 421. 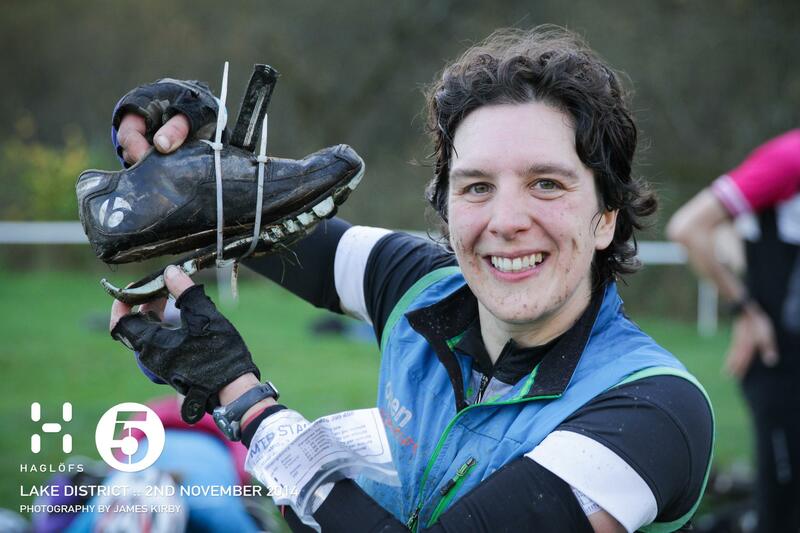 My time was slower than expected, but I had based my target on my experiences at the Hardmoors White Horse course, which had less climb and was much less technical. I was starting to get a bit emotional after all the effort, when I spotted my teammate Paul and got a hug off him. I never quite trust results until they have been announced and I’m on the podium. This despite everyone round the course confirming what I knew and it being on the tannoi as I crossed the line. Post race food. Thanks Green Canteen! Happy days, just time to eat and do my best to recover before the next race! (the awesome Gococo socks went straight on). Many thanks to race sponsors Salomon and for my cool race belt prize. Also to Paul Wildman Mitchell photography for a couple of race snaps and course director Charlie Sproson of Mountain Run. Great race this one, loads going on over the weekend for supporters / other racers, and the entry fee included porridge, pasta and a T-shirt as well. If you’ve been keeping up with my previous race reports, you’ll know that I’ve been busy falling off my bike, limping around and generally wreaking havoc on my legs. This has meant no running of any consequence in the last six weeks, although I have been biking more-or-less merrily. It was time for the first Open 5 in the winter series. With only five races this year, Lucy and I decided to give this one a go, even though I came with a health warning. I hadn’t run at all in 3.5 weeks and had no idea what would happen when I tried it. We had seen the entry list and knew there was some strong competition. With some good strategy and fast bike riding we thought we might still be in with a chance though. We had a plan: do a long bike (about 3.5h) and a short run / jog / walk or whatever I could manage (about 1.5h). Unfortunately, when we got the map, it wasn’t easy to string together a nice short high scoring run loop like it normally is. You had to run a fair way to get to most of the controls. I think this may have encouraged us to stretch a bit too far on the bike. At first it was all going well. We were moving at speed. In fact, Lucy was going so fast I was working very hard to keep up at all! We collected a 10 point control down a steep single-track, but the climb back up was so long I questioned whether it had been worth it. Lucy had enjoyed the descent though. Myself less so, as I did the worst possible thing on one section – starting then changing my mind, braking and going over the handlebars. Remember, commit or walk! Apart from that tumble I was really pleased with the way I was riding some of the technical stuff. I found myself thinking ‘this is mental’ as I tried to keep up on the descents, and was amazed at how my tyres stuck to slippery looking wet rocks. We sped over to Coniston Water and blasted along the road by the lake. Everything still felt like it was going well and we were making good time. In hindsight I think we had under-estimated how long the second part would take. 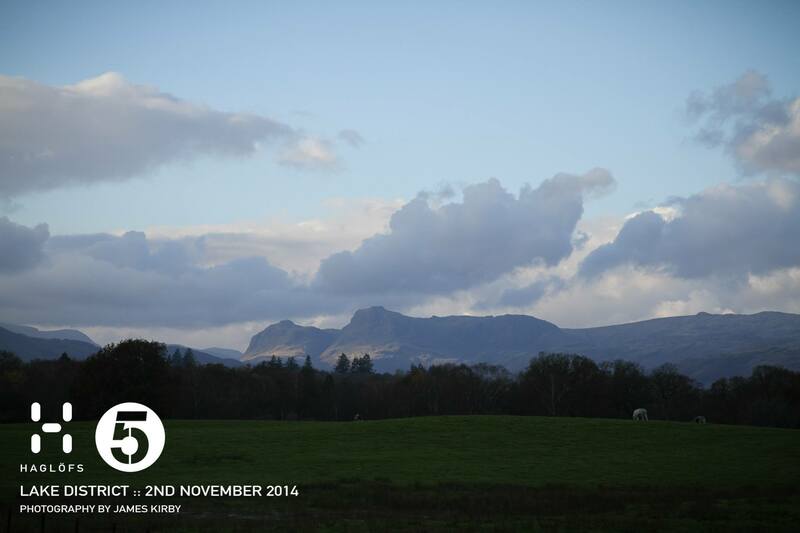 It feels like you’re ‘almost back’ to Windermere when you’re in Grizedale, but there is still a big hill in the way. There were some fantastic views and it didn’t rain! This problem was compounded as we spotted a better way to join up a control we had initially decided to miss. It was only worth 10 points but in the end really wasn’t worth it as on the way we hit a rough bridleway climb that had us walking and climbing round fallen trees. It didn’t end there though! I noticed that the sole of my shoe was flapping off at the heel. No worries, I thought, it’s fine when riding. Next I knew, I tried to unclip when on a road, my cleat just twisted in the shoe and I fell sideways onto the tarmac. Ow!! One of my newly-healed knee scars had torn open again and my hip was bruised. More to the point, we had to fix this shoe. Zip ties at the ready and Lucy tied my shoe back on for me. I felt like I was being treated by a medic! We set off again and the repair was 100% effective. But not long after Lucy got a puncture. She had a tubeless tyre and there was lots of new sealant in it. But re-seal it would not, despite us pumping it up and spinning it round a lot. We resorted to putting a new tube in. Unfortunately, this means removing the tubeless valve from the rim. It did not want to come out. Lucy talked of running back but it was miles and I was determined that this would not beat us. We sacrificed an important looking rubber bit on the valve and yanked it out with a pair of pliers. Tube in, pumped up and we were on our way. … to being full of adrenaline and feeling like nothing could stop me now. Meanwhile Lucy was feeling the effects of not having had a transition banana an hour before. I didn’t realise until we’d finished how bad it was, else I’d have made more of an effort to pass over a rice cake and hook up the tow. The two incidents took 20 minutes in total to sort out, which was 20 minutes we could not afford to lose, considering our over-reach! Our plan might not have been all that bad if we had not added the extra control in or had the shoe and puncture to deal with but, as it was, we sprinted into transition with (as Lucy was at pains to point out later), only 29 minutes to run. So, we ran. Three out and backs from transition. It wasn’t particularly interesting but I didn’t care as I was dying! My hip held up, but I definitely knew all about that 4.5h of hard biking and the total lack of recent running practice. I struggled to keep up and breathe and ignore my mind telling me to stop. On the way back from the last control I hooked onto the tow – we should have done it earlier as it was like magic. 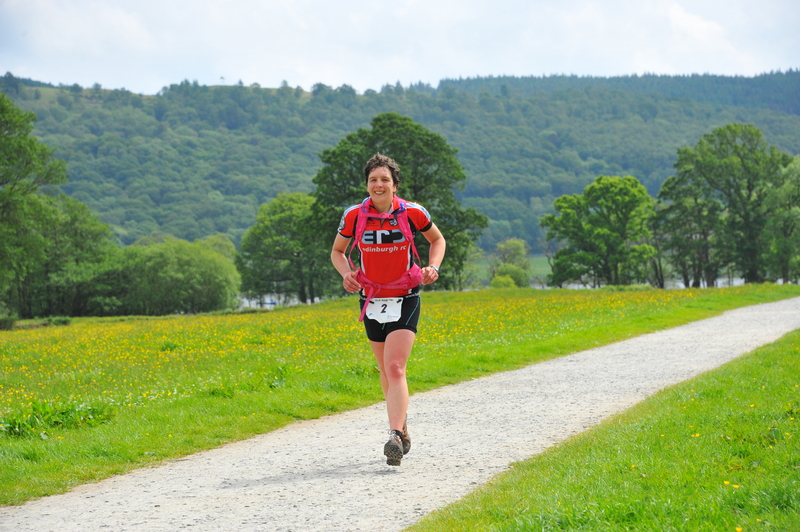 The finishing pictures clearly show me in a worse state! In the end we came 4th (results). Even with my hip problem we could have done better, though we had a mix of bad strategy and bad luck out on the course. We missed the podium by 2 points (and had 12 penalties!). However, I did truly enjoy the biking and am full of confidence despite the couple of tumbles. It was also a relief that my hip held out. Time to start a few regular runs so that I can be in better shape for next time. I am sure Lucy will be plotting payback with a killer run before the series is over! Fresh cooked wood-fired pizza went down a treat at the end 🙂 . Also, hello to James who was doing his first Open 5 and recognised me from this blog! Hope to see you again at the next one! With Itera looming, I was feeling like I hadn’t been out in the hills on foot enough. At first this race was penciled in to do with teammate Paul, but he was otherwise occupied being ‘official’ at the Commonwealth Games. I called a friend, who said yes! I was all set for 4 hours of running off road, whilst navigating to controls to maximise our score. 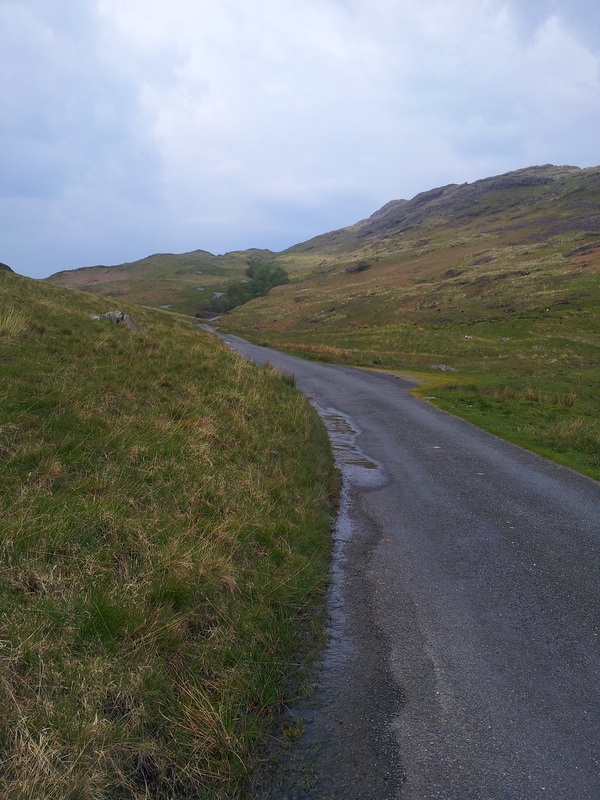 So Marie (this year’s super speedy Celtman champ) and I headed down to the Lake District on a Friday night in her van. We parked up just along the road from the start and after talking half the night away it was time to snuggle down in the back. Luxurious accommodation for me compared to a tent. We had set an early alarm as there was a suggestion that it would stay dry until later in the day. However, when we woke up the rain was pounding on the roof. I wasn’t keen on a pointless early start, so we promptly went back to sleep for another half an hour! I was slightly anxious. I haven’t done a run-only event like this before, and we were going to be using a Harveys map, which I’m unfamiliar with. At the hall we asked plenty of daft questions about what various symbols meant before we decided to bite the bullet and get going. We started off straight up a impossibly steep hill which made my calves scream. Marie was happy as she was bilberry hunting on the way up. We passed many sheep tracks, all going the wrong way. After gaining the ridge we briefly enjoyed a run along a path before diving back off the hill and finding a way through the head high ferns. We were convinced that here and there ‘we were following a path’, or that ‘someone else had definitely been this way’ … but these could have been figments of our over-active imaginations! Our route with the control locations marked. The pattern was set for the rest of the day as we (successfully) contoured round trackless terrain and went up and over ridges. We pondered whether the sheep would show us the way, how a guide dog might lead us to controls, that the skull in the grass was a sign (of what, I’m still not sure) and how we could do with a bionic extending arm to reach out and dib from afar. As we ran round a cliff top my foot slipped and a gasp from Marie made me look to my right – to see a vertiginous drop! As I concentrated on route finding, Marie concentrated on making up a song about slidy rocks. Past a stinking dead sheep we thought we might be sick. Unfortunately, this was the only out-and-back we did, so ‘nose nav’ was called into play as the mists came down on the way back. The second last control was an easy one on top of a hill. All we had to do was follow a bearing and run out along ‘The Tongue’. 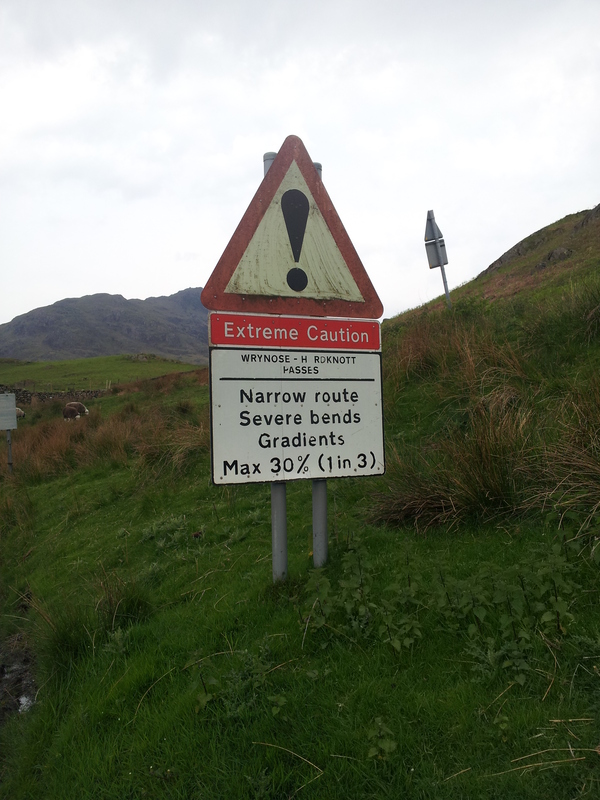 This was where we made our only serious navigational mistake. It was really foggy (not for the first time that day) and as we ran, it didn’t feel right. We tried to correct, but I couldn’t match the small patch of ground we could see to the map. A fortuitous combination of a family materialising from the mists and telling us that we were indeed where we thought we might be, and the clouds parting for a second to reveal a ridge got us back on track. The last bearing we took, so I could check it was right! It was, but our track (map above) shows us veering off further north. 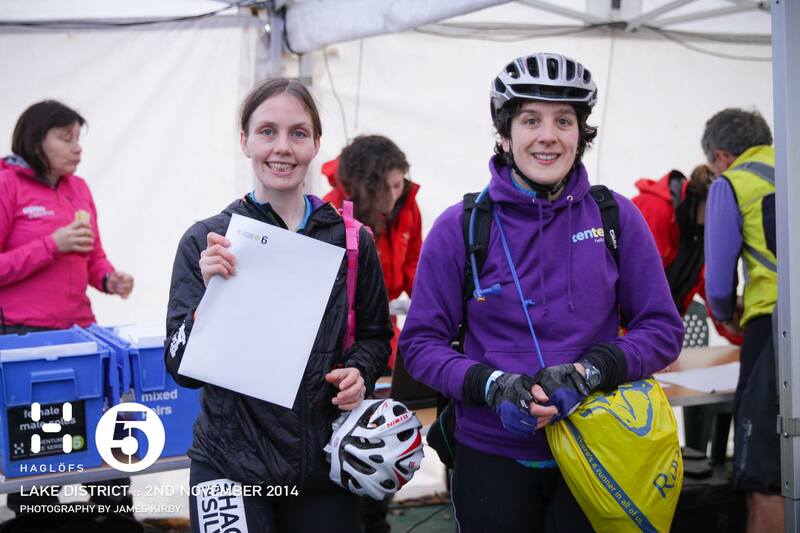 We discovered what one of the funny map symbols meant (peat hags), nabbed the last control and made for the finish. Only a steep downhill bum slide and more ferns to stop us! 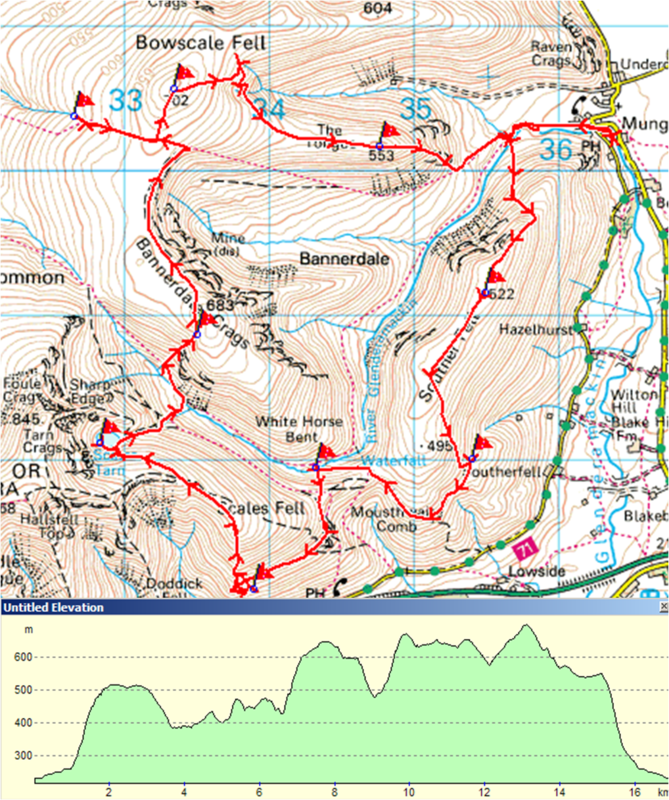 By avoiding the temptation of going up Blencathra (just because it looked fun), we had timed it perfectly. But we had not timed for our late mistake. We ended up sprinting for the end, trying to keep ourselves less than 10 minutes late, which would mean losing a LOT of points! We nearly took out someone photographing with a phone that we thought was the dibber box! We made it with just seconds to spare. Looking at the results and checking with some wizened fell runner types in the hall afterwards, it transpired we had not taken the popular route. My plan to do the hard stuff first had back fired slightly, as we only did hard stuff and ran out of time for the easier parts. Everyone else ran around the slightly less steep northern side of the map, where apparently the ground was ‘very runnable’. Oops! Never mind, we had a whole load of fun. It rained but we weren’t cold and it was great to be out in the hills feeling mildly competent about accurate navigation, even if our strategy left something to be desired 🙂 . After the run we filled up on delicious pea and mint soup, hunks of bread, tea and cake. The organisers were really friendly and it was a good race. We topped off the day by heading to Ullswater for a gorgeous 1 hour swim before heading back up the road. I’ll be doing the Itera expedition race in a team with three other people from the 9th August. If you want to read a bit about us and keep up to date with our progress, you can ‘like’ our facebook page here.